As a base I always use my favorite moisturizer- Egyptian Magic. It is THE greatest. I’ve written about it so many times and just swear by it. It always comes first for me in any makeup look (or when I don’t wear makeup at all ha!) When I want a particularly dewy look, I put a little more on as a base and it blends so well with my foundation. For foundation- what I’m using at the moment is Nars Luminous Weightless Foundation. It is free of harsh chemicals and parabens and I love how it blends in with the Egyptian Magic. I like to apply it with my fingers, but you could use a damp beauty blender as well. Next I applied my concealer: Nars Radiant Creamy Concealer in Custard. This is my go-to under eye concealer. It is-again-safe, and goes with many different skin tones. Ok on to the super glowy stuff! 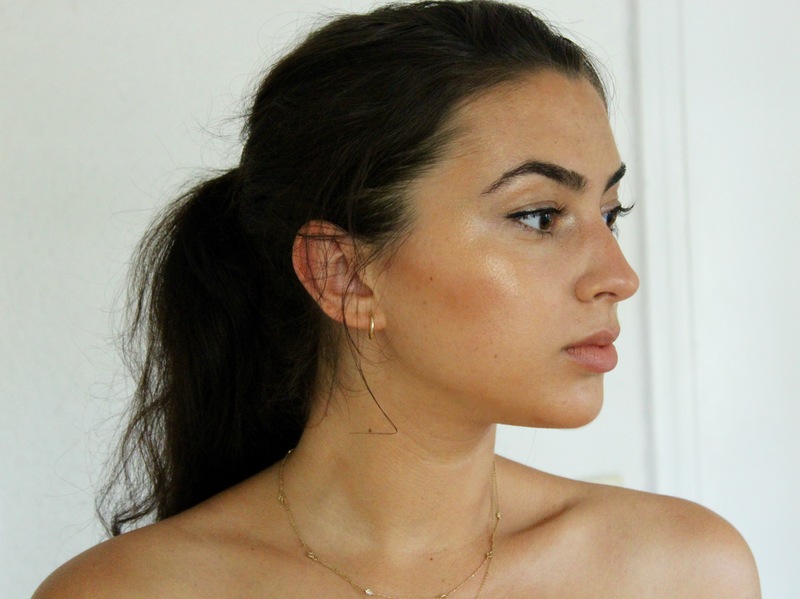 My favorite favorite highlighter now is the Glossier Haloscope highlighter. It is super creamy, not dry at all, and lasts the whole day. The outer ring of the product is infused with real crystal extract-which is unbelievable!! That is a real shimmer for you, folks. And there is a center made of moisturizer and Vitamin E. The whole stick has a base of coconut oil, castor seed oil, and sweet almond oil- LOVE! I didn’t even have to try this product to know it was going to be amazing. With ingredients like those, how could it not be?! There are two shades- I used Topaz (infused with real golden topaz) which is a darker, sun-kissed, bronzey shade. And there is also Quartz (infused with rose quartz) that is a more pearly, iridescent shade for all skin types. They are fragrance free and paraben free as well-amazing! I just apply it directly to my face from my brow bone to my cheek bone and blend in with my fingers. It really gives a stunning sheen. 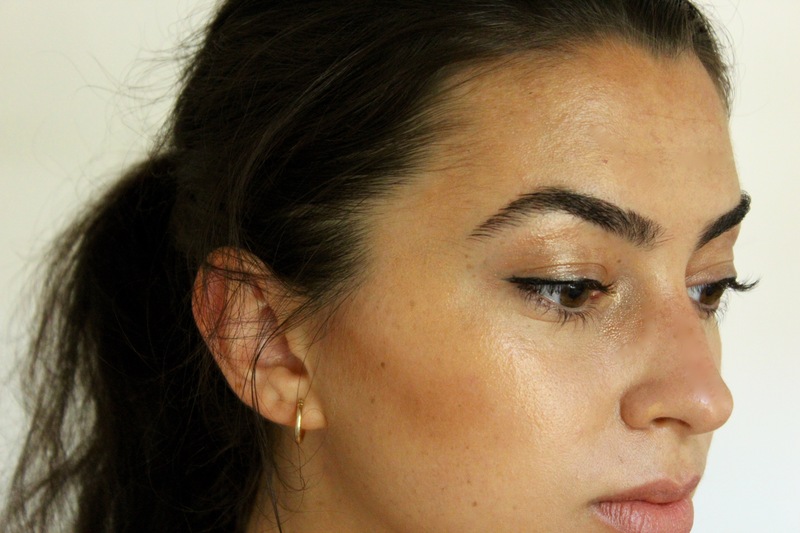 My other absolute favorite shimmery staple of the moment is the RMS beauty eye polish. Rose-Marie Swift is a world renowned makeup artist and creator of the RMS beauty line. She is extremely concerned with providing cosmetics that are safe and as natural as possible. This eye polish is made with a base of coconut oil, beeswax, jojoba oil, and rosemary extract. All of our skin is sensitive, but the skin on our eyelids is the most delictate of our whole body. I love knowing that what I put on there is chemical-free. 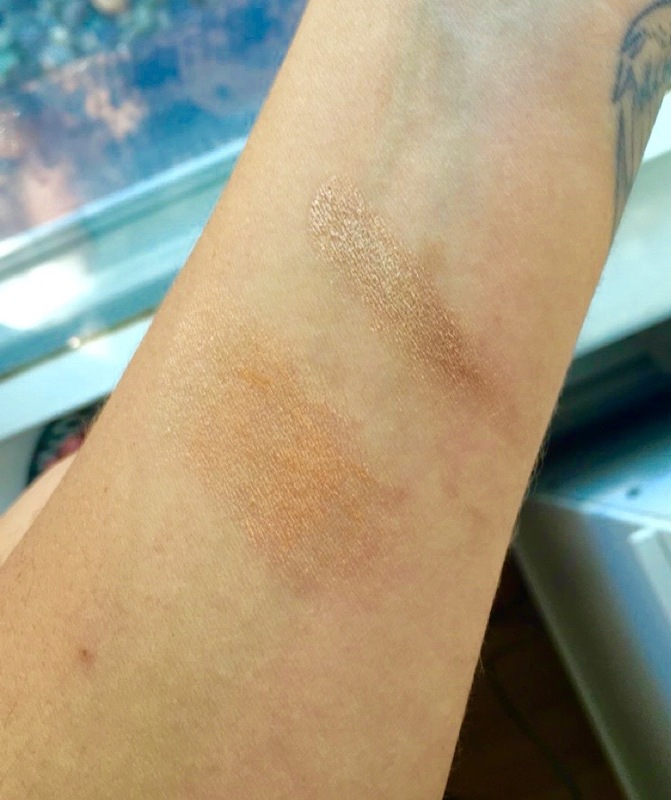 I use the color “Solar”- a rich, bronzy, shimmer that is perfect for everyday, and day or night! It can also double as a highlighter. I put it all over my lid and in the corner of my eye/tear duct. Sometimes when I don’t really want to wear any makeup at all, I just swipe on a little eye polish and feel instantly beautiful. It’s creamy, pigmented, and so natural looking- love love love. On the bottom is a swatch of the glossier haloscope highlighter and on top is the RMS beauty eye polish used in this look. 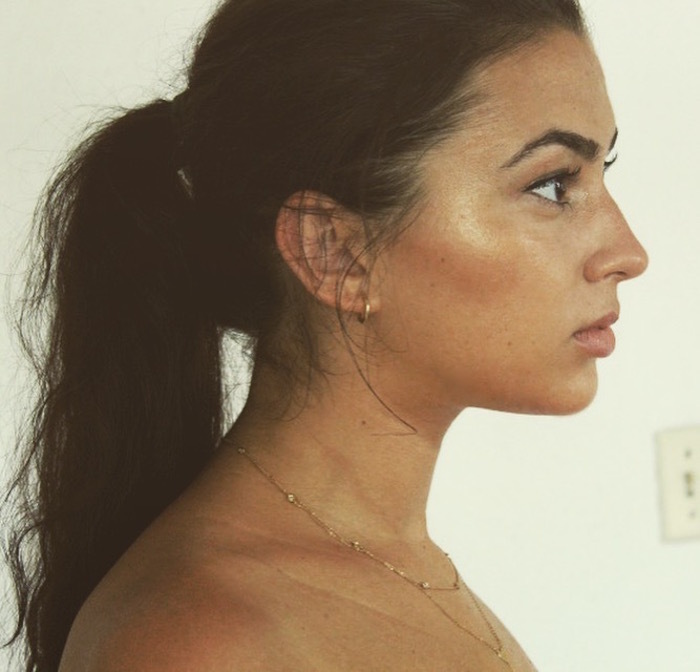 I hope you guys liked this look and my suggestions for using natural products to create it! And don’t forget to compliment your glowy look with some delicate, gold jewelry. LOVE that soft, feminine look! I’ve heard such good things about Glossier but never tried their products. You look beautiful in these photos! love nars foundation! one of my faves! yes! & really i didnt know that! You are stunning!! love the post! I Love so much this look! Glowy and bronzed, just natural. And best of all is thoses are chemical-free products! Great post!